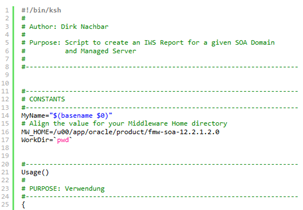 From Oracle SOA Suite 12.2.1 on, Oracle added a nice feature – The Integration Workload Statistics, which you can compare to an Oracle Database AWR report for your SOA Suite. As I am more coming from the Administration site, I prefer to have script-based solutions. On your server which is hosting your SOA suite simply perform following steps as SOA Suite Software owner: Read the complete article here.